Google's latest mobile operating system Android 4.4 Kitkat has been officially released with Nexus 5 and its update is rolling out for other compatible Android smartphone and tablet devices as well which includes Nexus 4, Nexus 7, Nexus 10, HTC One Google Play Edition, Samsung Galaxy S4 Google Play Edition etc. If you're not running or using an Android 4.4 Kitkat device but still you can download and install all new apps, games, programs, wallpapers and features of Android 4.4 Kitkat via Direct Download Links of Android 4.4 Kitkat Default Stock Applications and Wallpapers for Other Smartphones and Tablets available below. 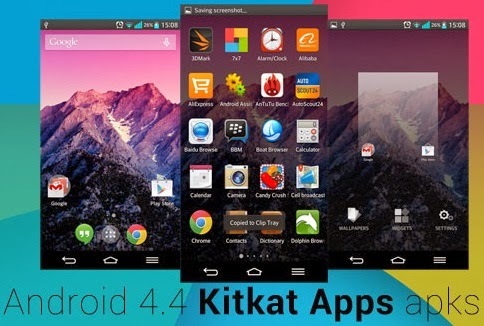 All-In-One Android 4.4 Kitkat Pre-Installed Default Stock Applications, Games and Wallpapers Package for Non-Android 4.4 Kitkat OEM Devices such as Samsung’s Galaxy S4, LG G2, Xperia Z1, Moto X etc. is officially available which includes programs like; New Google Experience home launcher, New Stock Email app, New Clock app, New Google Calendar app, Hangouts v2.0 app, New Camera and Gallery app and New Keyboard app with emojis and lots more. For the ease of users all apps, games and programs are available in .APK file format in a single .ZIP file but all these APK files may not work on some versions of Android and you might face some crashes and bugs when running any applications or games because it’s not officially supported for other Android devices. So what you're waiting for just Download and Install Android 4.4 Kitkat Pre-Installed Default Applications, Games .APK Files and Wallpapers Package Manually on any other Android Smartphones and Tablets.